After a year in Early Access, we are excited to bring Faeria out of beta with our 1.0 launch for PC and iPad! Faeria 1.0 - play now! The full launch version of Faeria is now available globally. You can grab it through Steam for PC, Mac, Linux, or the App Store for iPad. To celebrate our time in Steam’s Early Access, for a limited time we are offering a 40% discount (from $34.99 to $20.99) on our brand new Steam Pack, available exclusively on our Steam store page - check it out as a great-value alternative to buying in-game. It’s been a thrilling ride. Let’s talk about how we got here and, of course, share with you what’s included in today’s update. To celebrate our progress over the last year, we’ve put together a little overview of Faeria’s journey through Early Access. We call it: Faeria Tales: The Road to 1.0. Ever wonder how many eggs have hatched into Yaks? Curious as to who in the community has won the most prize money so far? 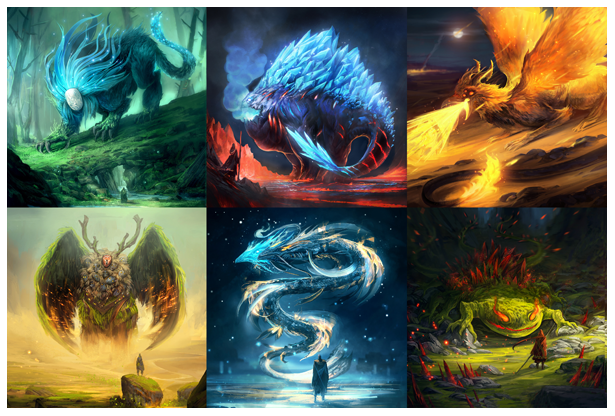 Well, you’re in luck, because our Faeria Tales contain these interesting facts and many more! As proud as we are of the last year and of Faeria version 1.0, we absolutely could not have done it without our many thousands of Early Access testers. You have contributed over 40,000 pieces of feedback that helped us improve the game - and those are just the pieces we can count! We extend a sincere thanks to each and every one of you. We couldn’t ask for a more amazingly friendly and supportive community that has formed around our game. We have made several changes to improve the early game experience for new users, including many enhancements to the prologue levels and a series of User-Interface tutorials that should help introduce new players to Faeria. We’ve made massive improvements to our rewards and progression system. Our goals here were to provide more incentive for logging in each day, while at the same time making the whole experience a little more dynamic and interesting. In general, we’d like to front-load the amount of rewards a casual player receives just by logging in every day and completing their Daily Quests. Each player now receives a gold bonus the first time they log in to Faeria, every day. This bonus gets larger over time with consecutive logins, and has special rewards at the end of each week. The rate of levelling up has been increased to be 3x faster than before. At each level up, the player will receive one Mini-Chest. The ability to choose a card at each level up now appears every 10 levels, in the form of a Mini-Chest, and will never contain Common cards. While we still think this system is a great way for a player to be able to increase their collection, it too often left you with a negative feeling when getting a Common card after a long period of grinding your level out. Therefore, we’ve made level up rewards more consistent throughout, cranked up the pace of them, and spaced out valuable card choices. The amount of Gold, or equivalent value, contained in a Mini-Chest can vary, but on average will be higher in a Mini-Chest awarded for leveling up than one given after a victory. Solo content rewards have been improved by adding mid and long-term objectives in order to better reward a players’ progress in this mode. In Version 0.96 last month we introduced the first part of our new User Interface for both PC and iPad. Today we’ve added the finishing touches and applied some polish. Shop Improvements and Mythic Chests! We first mentioned the intention to add Mythic Chests last year, and even gave some to a few of you that couldn’t yet be opened. Now they can, and you can even buy more! Mythic Chests are precious vessels that contain a range of cosmetic items as well as Mythic cards, with four objects in each chest. In the shop, we have restored the ability to buy more than one Battle Chest at a time, and have introduced new behind the scenes functionality which will allow us to offer regular rotations of cosmetic items, special offers and more. 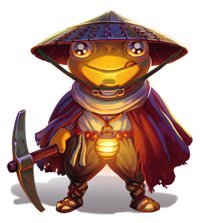 Fugoro’s nephew, Goki, is now available for hire from our shop, and he’s eager to mine you some gold. We’ve replaced the Gold Fountain with this little guy, who offers a very similar service! You can hire Goki in the shop for the same price as the old Gold Fountain, and he too will give you an immediate reward of 5000 Gold. Goki will then mine for you each day for 30 days - he guarantees at least 300 Gold each day, and sometimes finds a LOT more! Those of you who have an active Gold Fountain at the time of this update will have the remainder of their Gold Fountain time accelerated and will be compensated with the amount of Gold you would have received, so you may hire Goki right away if you'd like. Please see this forum post for a full explanation on these changes and why we've made them. The added Slaughtering Shadow’s faeria cost is increased from 1 to 2. Life decreased from 4 to 3. Lake cost increased from 3 to 5. After testing in Belgium and Canada over the past couple of months, along with the help of several hundred community members in our iPad testing program, we are excited to roll-out Faeria for iPad globally, available now in your local App Store! While it has been possible to play Faeria on Linux during Early Access, those of you that have tried it will know that it came with its fair share of crashes. Its for that reason that we’ve kept Linux labeled as officially 'unsupported’. However, that’s all changed. As of today you should now enjoy a smooth Faeria experience on Linux. Status change: Fully supported! With tremendous effort from our community volunteers, we are pleased to apply a wave of localization improvements across the board for all languages. In no way could this have been possible without the help of our dedicated translators. We cannot thank these players enough, and hope you enjoy their improvements in helping make Faeria a global community. There is now a toggle button in the options menu to permanently display deck and hand count. It is now possible to directly switch between deck building and crafting modes. The second Solo lane now unlocks when the training pack is completed and the third Solo lane now unlocks when the Seifer pack is completed. Solo hints are no longer clickable. We’ve added a confirmation dialogue after clicking the “Sign Out” button. A bunch of new hints for the game loading screen have been added. This patch contains a large number of bug fixes. Please see this post on our forums for a list. Just because we are leaving Early Access doesn’t mean we’re going to stop listening to the community for the best ways we can improve Faeria. We have big plans for even more new features and content in 2017, and are looking forward to hearing what you, our players, want to see. It goes without saying that we’ll be keeping an eye on bugs and balancing at all times. One big thing we are working on is expansion onto more devices: as of today we officially support iPad and Linux players globally, and in the near future we will expand support to Android tablets as well as iPhones and Android phones. What aren’t we telling you yet? Oh, okay. You want more. You can tell we’re holding back. Fine. In addition to Faeria on your phone being right around the corner, we’ve got some really incredible stuff coming your way. We’re just… not quite ready to spill the beans yet. How about instead we mobilize a War Effort. Click here to prepare for battle.